A while ago I made graphs for teddies made for Knot Forgotten (here is the original post). They recently changed the patterns a bit, so here are the new graphs that will work for the new patterns! If you haven’t crocheted using graphs before, here is a video that explains how it works and how to change colors. 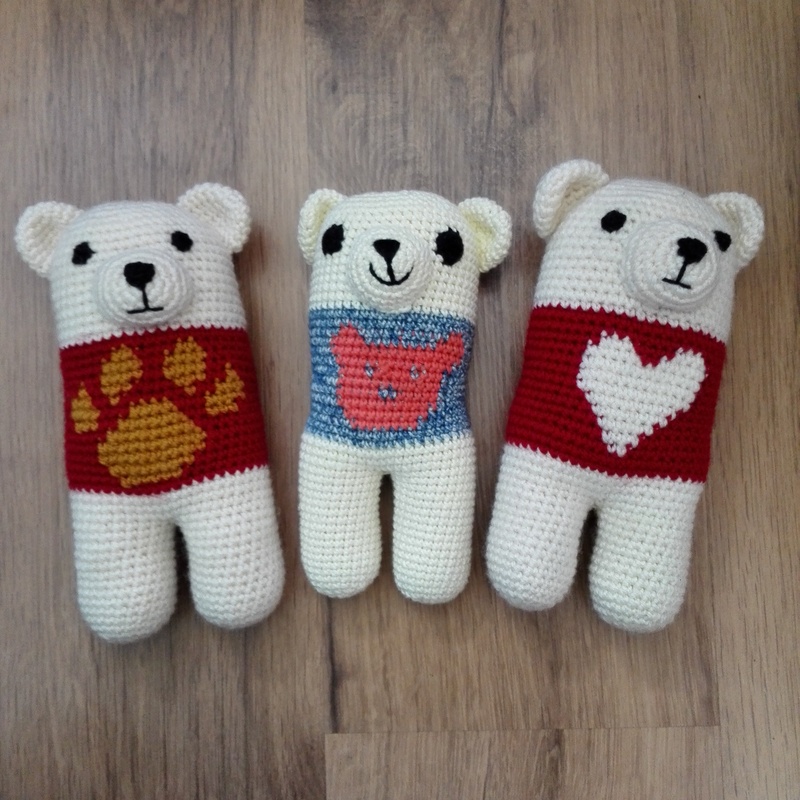 Here you can find Justine’s pattern for the teddy. 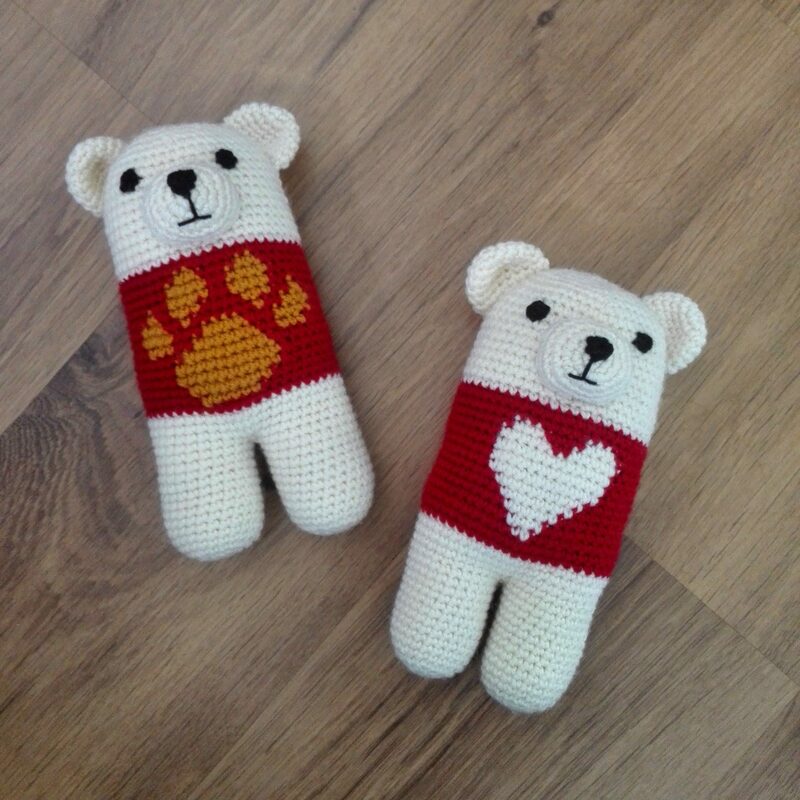 Until row 19, you use Justine’s pattern for the teddy that you can find below. After that, you start with the shirt so you can use my pattern. After row 30, you use Justine’s pattern again. 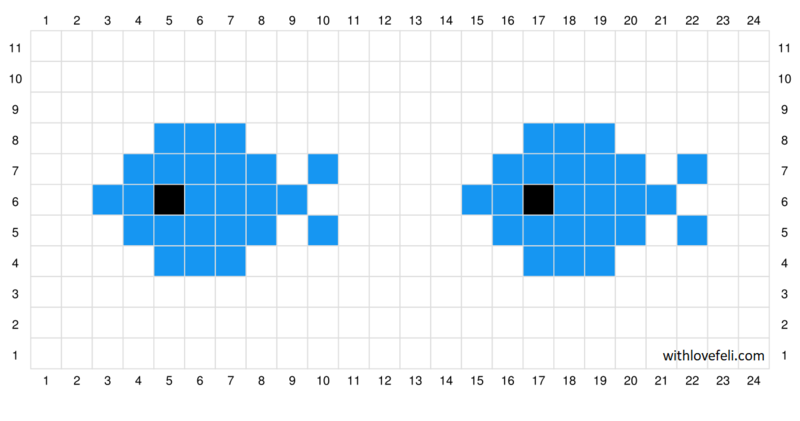 Here is the pattern for the heart, both written and in graph form. In my case, TC=T-shirt color=red and AC=accent color=white. If you want, you can make even more designs this way, anything you can imagine is possible! (well, maybe not anything, but lots of things are possible). I used stitchfiddle to create my graphs, which are 24 stitches by 14 rows. You can put these images on a shirt by starting each row with sc12 in your “background” color (which is white on all my graphs). After this, you so whatever the graph states. Once you’ve done the 24 stitches from the graph, you do 12sc again. This way, the image from the graph will appear on the front of the shirt. It’s a bit difficult to explain, but I hope you understand! If you don’t, please don’t hesitate to leave a comment so I can try to explain the part you struggle with. If you share this pattern on instagram, be sure to tag me (@WithLoveFeli) so I can see your creation! If you want you can also follow me on facebook and youtube, so you can see my new patterns and videos when they come out.